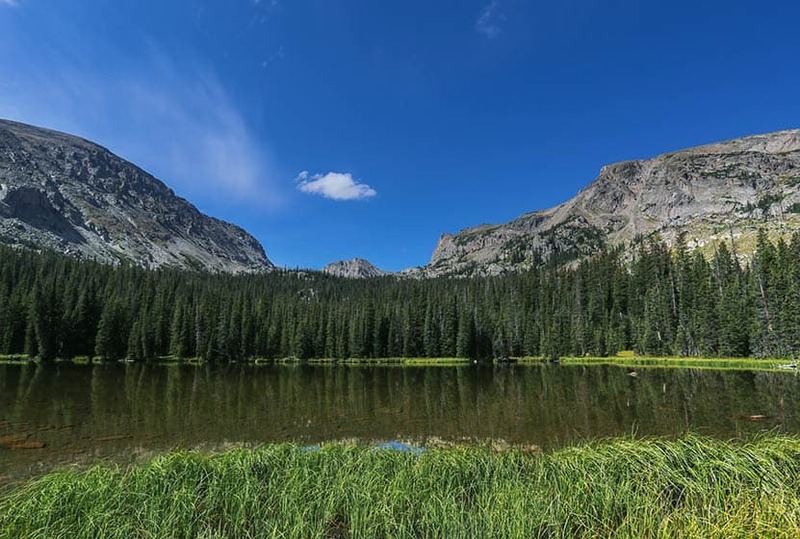 Ouzel Lake is nestled in an expansive valley in the Wild Basin, and is one of the better fishing destinations in Rocky Mountain National Park. It’s a moderate, 4.9 mile, creekside hike that passes several beautiful cascade waterfalls, including one of our favorites, Ouzel Falls. 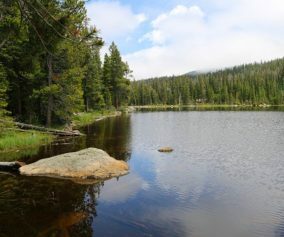 Combine the hike to Ouzel Lake with an overnight, and a journey to the shores Bluebird Lake. 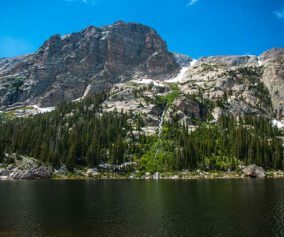 Explore the full Ouzel Lake hike profile below for trail map, driving directions, and more tips and details to help you enjoy this adventure in Rocky Mountain National Park. It’s 4.9 miles one-way to Ouzel Lake. 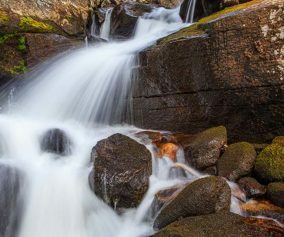 The trail begins at the Wild Basin Trailhead, and takes hikers through the central area of the Wild Basin, past three cascade waterfalls: Copeland Falls, Calypso Cascades, and Ouzel Falls. The first waterfall, Copeland Falls, is just 0.4 mile into the hike on this first, easy segment of trail. For details on accessing both the lower and upper leaps of Copeland Falls, check out our full trail profile for Copeland Falls. The path follows North Saint Vrain Creek until it encounters a first trail junction. The trail to the right leads past a series of backcountry campsites. These are reservable through the Rocky Mountain National Park Wilderness offices and make for a great place to stay for longer adventures into the Wild Basin area. The left-hand trail is the correct way towards the Bluebird Lake trail system and Ouzel Lake. Having taken the left-hand trail, hikers cross a large log bridge spanning North St. Vrain Creek. Pause when you hear the sounds of an unnamed cascade that can be viewed from the bridge area. Soon after the bridge, the trail meets with a second trail junction at Calypso Cascades. Taking the right-hand trail, the cascades (named after the purple orchids that grow along the creek) come into view. 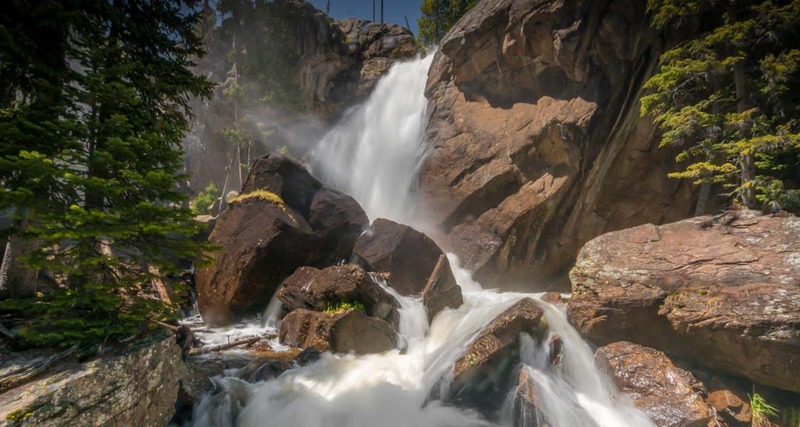 The path crosses a second bridge at 1.8 miles, then things begin to get more challenging, as the trail weaves through a set of switchbacks to Ouzel Falls at 2.7 miles. After about 0.4 mile past Ouzel Falls, the trail comes to a junction with the Bluebird Lake trail, 3.1 miles into the hike. The way to Ouzel Lake takes the Bluebird Trail (left). This final 1.8 segment of the hike to Ouzel Lake gains a ridgeline and becomes more demanding. It’s a desolate segment of trail, charred by a fire in 1978. However, wildflowers make their way up through the barren landscape, and the surrounding mountain peaks come into full view due to the few trees left by the burn. 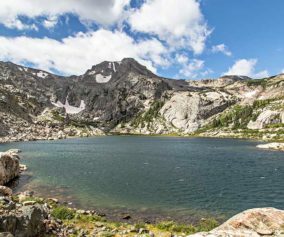 At 4.5 miles, there is a marked trail spur that leads to Ouzel Lake, bending its way around a small pond to Ouzel’s northwestern shore. At the lake, you’ll find more trees and a lot of marshland–and marsh = mosquitos, so be sure to bring repellant. If you are looking to try some deet-free repellant, we have had some great luck with a lemon-ecualyptus repellant made by repel. The fishing up at Ouzel Lake is great! Of course, a Colorado State fishing license is required. Camp + Hike + Fish: Reserve one of the two backcountry camping sites along the Bluebird Trail to spend some time fishing Ouzel Lake and exploring the other destinations along the trail: Bluebird Lake, a waterfall between them, Lark Pond, and Pipit Lake. Contact the RMNP Wilderness Offices to reserve a site. Food Storage: There are food storage lockers available at the Wild Basin, Finch Lake, and Sandbeach Lake Trailheads. These are required for visitors staying overnight. Backcountry campers are required to use bear resistant food containers. Photo: We would like to express our gratitude to Ed Ogle for sharing such an amazing photograph of this hike to Ouzel Lake in RMNP.